Whenever the leaves change, it heralds more than just a new season. It means that people are starting to trade in their baseball jerseys for football jerseys. And if it’s football season, it’s also tailgating season. Tailgating parties don’t have to be held out of the trunk of your car in the middle of a crowded football stadium parking lot. 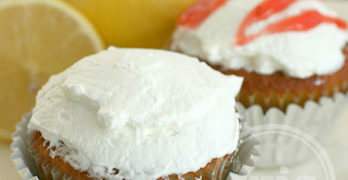 You can ditch the crowds and have a comfortable seat to enjoy the game by having a tailgate party at home. Just invite good friends, have some good food, and you’ve got the ingredients for the ultimate tailgate party. While grilling is a must-do for us, I also like making sure we have plenty of snacks and tidbits for people to munch on while they’re watching the game or just chilling on the couch. Our go-to snacks are usually an array of chips and dips. 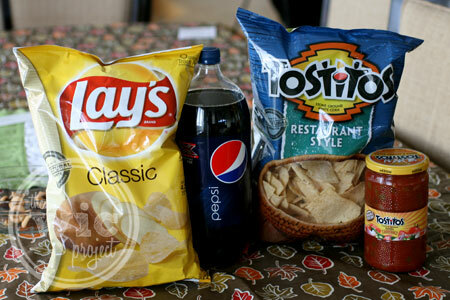 Frito-Lay has some of our favorite tailgate chips, including Lay’s, Cheetos, and Tostitos. You really can’t have a tailgate party without these crunchy, salty snacks. For something a little more hearty, pick up a bag of Ruffles MAX Smokehouse Style BBQ Flavored Potato Chips and make these delicious Ruffles Max Smokehouse BBQ Chicken Quesadillas. If you can’t find the Ruffles Max chips, you can try using BBQ Flavored Lay’s potato chips as well. 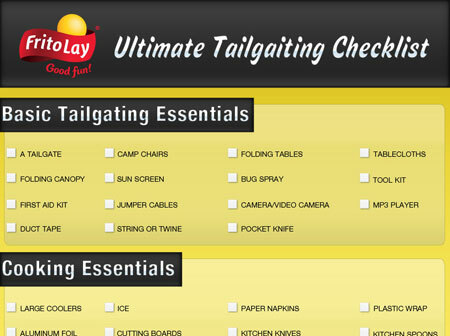 If you’re planning an upcoming tailgate party, you can use this handy checklist from Frito-Lay to help you get your party planned and ready to go. From every possible chip flavor to delicious tasting dips to using it to create a tasty appetizer or snack, Frito-Lay chips are a must-have for any tailgate party. Yeah, we tailgate, but we don’t go crazy, we live for keeping it simple! I love burgers & brewskis best! I don’t tailgate but now that you have me thinking about it I might have to give it a try. I’ll pack my Fritos and Lays Classics and hit the road! I have never tailgated but it sounds fun. I have never been tailgating. I’ve never been tailgating either. But we do love Jalapeno Tostitos and cheese or salsa. Yum! we used to do more tailgating before we had our 3yr old son. We don’t do much of anything like that these days unless it’s summertime & little Mr. is up for the outting. Otherwise, we Alllllll pay 😉 lol. 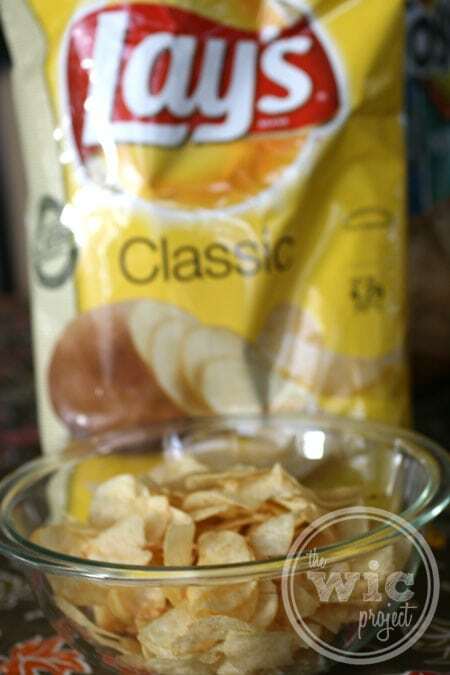 Oh yes, and plain lays potatoe chips are BOMB! Perfectly simple & salty. Yum! I don’t really tailgate, but my family does love watching the football games. We are big on chips/nachos and pizza as our go to foods. I don;t tailgate, but love taquitos. I have tailgated in a while but nachos are always good tailgating food. We used to always go to the Steeple Chase races & Gold Cup and we’d tailgate. We loved having pulled pork barbeque sandwiches. Chips and salsa and cheese sauce. yes, we tailgate. I love anything spicy! No, we don’t tailgate…but we love tailgate food such as grilled Italian sausage with peppers and onions! We will do some eating and watching the tv at home before the game, but we don’t leave home to do it. I love the dips, especially french onion. Yes, and their favorite is chicken wings! No we don’t but it would be fun and yummy to go to one sometime. We love to tailgate. My favorite food is BRATS! I love a good cheeseburger when tailgaiting. Thanks! I don’t normally tailgate but my favorite tailgate food is mini corn dogs. we love hot dogs, hamburgers and chips, I love having a small grill that is portable. yes we tailgate. we love subs. Because I live in Oregon…and, I’m basically a fair-weather spectator (LOL), I don’t tailgate too often. However, when I do, I have a great time–enjoying the company of good friends while eating delicious food! I like too many foods to name just one. Frito-Lay products are always a part of the celebration! No, I have never tailgated. But I like grilled bratwurst. We do tailgate a few time a year at Old Dominion. This year I am all about the Slider. I have made burgers, roast beef with caramelized onions & horseradish sauce, crab cakes, & a surprising fav crab salad sliders. We have a few more games to attend & those will be dedicated to new wings recipes. I have never Tailgate yet but if I did a good polish dog and chips would be my favorite. I sure do – and I love beer brats with mustard and sauerkraut 8| Yum! We like hot dogs and burgers when we tailgate. We’ve never tailgated, but we enjoy tortilla chips and salsa or queso for our parties. I have only tailgated for college football games, and since I have been out of school for a few years, I only go to Homecoming. I am vegan, so I love veggie dogs when I tailgate. And beer. Lots of cold beer. Chilli with a make it yourself add on bar, with all kinds of toppings. i have never tailgated but think it would be a blast….I’d love to tailgate with ribs! Have Taigated at Nascar race but not NFL game, its a blast. No I don’t tailgate. Watch the games from home. I don’t tailgate, but I will be joining my neighbors at their tailgating parties next season! I would love to be able to contribute … or have a party of my own! We usually make breakfast food for a noon game, pancakes, sausage, french toast, potatoes! We “tailgate” outside in the driveway when it is warm enough. We love to cook up burgers or chicken on the grill. Thanks so much for hosting this great giveaway! I do not tailgate. If I did, my favorite food would be hot chicken wings! I tailgate every now and then, and since I’m from the midwest, I love bratwurst and corn on the cob (if we can get it) as a tailgate snack. We like burgers and baked beans. I love my zweigle hot dogs! !I can only get them in Rochester NY…live in FL now..Thanks for the give away!!! I tailgate and I love potato chips! Nachos have always been my favorite! I don’t think I have ever tailgated. Yes, italian sausage and pepper sandwiches. Sometimes we tailgate and I love hotdogs. Yes we do and I love to do chili dogs! Yes, we tailgate when we go to West Point football games. We don’t get too fancy. Usually have hamburgers and hotdogs. We do, we love hot sausage with peppers and onions! Yes I do and I love burgers, hotdogs and nachos. I don’t do it much, but burgers and hotdogs. WE don’t tailgate but if we did, we would love barbecue anything. I love hot wings and dip! I have never tailgated, but at Sports parties at home, I love tortillas with a hearty seven-layer dip. I have never tailgated but would like chili & wings. I haven’t tailgated in a long time but I like to have burgers. I would love to win! Go Cowboys!!!! We usually grill and have pop. We do tailgate and love chips,dips and anything grilled. Love to make nachos for tailgating (or any get together). Re-fried bean, salsa, Tostito scoops, cheese, lettuce and a TON of Hot peppers…. yum! I don’t tailgate, but do have friends over to watch games. We love doing a mexican bar with fixin’s so people can make their own favorites. Since there’s not a pro team in my state, we do miss out on those, but our University has some great tailgate parties and my kids and I will go at least once during the season. We love to bring my awesome Jamacian Jerk Chicken! I love Chili cheese dogs when I tailgate. I do not tailgate, but if I did pork BBQ would be on the menu. We usually bring fried chicken wings, potato salad, chips and pepsi! We don’t tailgate but we do party at home. ive never tailgated. sounds fun though! We moved to California and away from our “home” teams. When we lived in Oklahoma we loved to tailgate at the stadium with our friends. Other times we hosted game day parties since we lived close to campus. We love tailgating! Favorite food is nachos and grilled polish sausage. I have only ever tailgated a couple times in my life. But the best tailgating foods are dips: 7 layer dip or hot artichoke dip with tortilla chips! I do not tailgate but I love wings, chips, burgers, basically all of the tailgate food! Not lately, but we do have get togethers on game day – we love 7 layer dip, wings, sliders etc. Who doesn’t love a great tailgating party with a great group of friends! Hot dogs, Nachos, smores and more! I have never tailgated (is that a word?) but by fav food for watching the game would be Hot Wings and if I were to do it I think I would love anything grilled! I’ve never tailgated before, but chili would be on my list! We don’t tailgate, but we like hot dogs on the grill. My favorite tailgate food is bbq pork. we love to tailgate! I love buffalo chicken dip. I love tailgating 🙂 My favorite is hotdogs! We do not tailgate, but we still love to eat while we watch the games. Mostly chips and dip or hamburgers and hot dogs. We just tailgate at the house….sometimes with friends over, sometimes its just us. Love to make chicken wings, and we always have to have chips * dip. Its like a staple of a tailgating get together!! I don’t tailgate, but I like burgers on the grill. Yes I do it with hubby. Brats and chips and dip are a must. I like hotdogs grilled with bacon, onions and peppers. We tailgate and I love the hotdogs! I generally try to avoid being the kind of person who gets invited to tail gate parties. I make chili quite a bit, I understand that chili is a food commonly found at such events. I just love grilled cheeseburgers & hot dogs! I have never tailgated before. But if I did I’d like hot wings. We did it one year that our HS team went to state but that is the only time we have done it before. We haven’t tailgated in a very long time. When we did my husband made awesome hot wings and a chili dip that was to die for! I need to join your winners circle. NO, I DO NOT TAILGATE. I WATCH MOSTLY FROM HOME, ALTHOUGH I HAVE GONE TO A FEW VA TECH GAMES. meatballs in sweet n sour sauce are my go to snack! I love tailgaiting at Iowa State games and eating chili!! I have never tailgated but would love to. I don’t tailgate, but if I did, I would have scoops with a dip made of cream cheese, cheddar cheese, and beef chili heated in the oven! I’ve never tailgated, but I would make sure to have lots of wings and tostitos if I did! I love a great 7 layer dip! We tailgate by having block parties where we BBQ in the cul-de-sac and watch football on TV’s the guys bring out. I like to make artichoke dip. We don’t tailgate, but we do watch games on TV, and nachos are mandatory! LOVE TO TAILGATE WITH BRATS AND CHIPS! I don’t tailgate often, but when I do, beer brats are a must! My husband and our friends are tailgaters. We always have hot dogs, cheeseburgers, wings, chips and a mexican dip. tailgating means hamburgers…and lays chips and dip! We tailgate very rarely…but I love buffalo chicken dip! We don’t tailgate but have our own parties at gametime. Our family loves to tailgate and my favorite snack is the chips and dip! Pizza Fondue is always a hit. I have never tailgated, but if I did I’d go with the traditional hamburgers. Yes, I tailgate and my favorite food is BBQ ribs! i don’t but i have always been fascinated by people who are really into it. it seems fun! I do go to a lot og game day parties. Chile con queso is a must have. Thanks for the giveaway. I don’t, but I love tailgating food like burgers and chips. No< I have never Tailgated. If I did, I would love burgers! I tailgate in my backyard, but we call it a bbq. Buffalo wings are my favorite tailgate food! i have in the past and im a hamburger and hot dog girl. Yes I do tailgate. I love nachos and cheese. I don’t tailgate, but I’d love to! I love to tailgate!! My favorites are the cocktails and pig in the blankets. I don’t really tailgate, but I do love hamburger sliders to eat. I dont tail gate anymore, but our favorite food was chili when we did. We do tailgate to our kids sports sometimes and we like to bring sub sandwiches and chips. I love to tailgate, actually going on Sunday. Love the drinks and BBQ steak. We haven’t tailgated in a long time but we love to grill brats when we do go. I don’t really tailgate, but I sure love chips/dip and chicken wings. Yes I tailgate and my favorite food is pulled pork sliders! We don’t tailgate because we watch games on tv. Would love to tailgate but with little ones here we usually have people over to watch the game. i must be honest i never hostd or attended a tailgate party yet but would love to!!! I don’t really tailgate that much, but anything barbecue-related is the best! I love to tailgate! My fave foods for tailgating are BBQ Burgers & Ribs! I don’t tailgate, but I will if I win! I am not a bona fide tailgater. Our favorite to eat when tailgating is burger, hot dogs, and chips! Chips and Salsa! Wings or Burgers also! We haven’t tailgated in a long time but when we do, burgers are our fave! Yes, and we love grilling burgers! I’ve never been to a professional game before but we do tailgate at my daughter’s softball games. We do hot dogs and hamburgers. thank you! I haven’t tailgated yet, but would love to! I have not tailgated, but, if I did, I’d have to have brats. We tailgate all the time. Hot dogs, chicken, and sausage dogs. We tailgate a lot at concerts! Fried chicked and beer: the perfect combo! I like chips and dip! Yes, love to tailgate. Sub sandwiches is my fave food. Easy and convenient. We don’t tailgate really but dips are always good. My favorite tailgate food is hot dogs and hamburgers. Thanks for the giveaway… favorite tailgate food: grilled italian sausage-onion-green peppers !